Chapman University Fowler School of Law offers a tax law emphasis as part of the Juris Doctor program, which gives students a solid foundation in an area of law that impacts both individuals and businesses. Attorneys from many diverse practice areas encounter tax-related issues when representing their clients, and Chapman’s tax law emphasis program is designed to expose students to a variety of tax issues encountered in practice. Graduates who satisfy the tax law emphasis requirements earn a notation on their transcript and receive a certificate upon graduation. In addition, an LL.M. in Taxation degree is offered at Chapman, giving students who wish to pursue further specialization in tax the opportunity to earn an advanced degree. For J.D. students, the program offers the chance to interact with practicing tax lawyers and access to comprehensive tax law resources. Students who complete prescribed tax law courses while pursuing the J.D. degree will also be able to get a head start towards the LL.M. in Taxation degree. Between J.D. and LL.M. tax courses, a student may receive up to 12 units of credit towards their LL.M. in Taxation at Chapman. This represents close to half of the 27 required units to earn the degree, and can significantly reduce the time and expense of obtaining your LL.M. Chapman is the only law school in the nation to offer both trial and appellate level tax clinic courses. 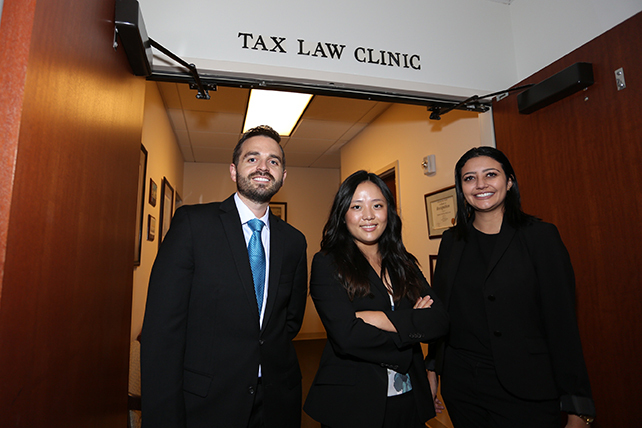 In the trial level clinics, students represent taxpayers before the Internal Revenue Service or in the U.S. Tax Court on a pro-bono basis. Students gain valuable client interviewing skills and apply negotiation, advocacy and trial litigation techniques while providing a service to taxpayers who might otherwise lack legal representation. In the years that the program has been in existence, students involved in the clinics have served hundreds of unrepresented taxpayers, saving them hundreds of thousands of dollars. In the appellate level course, students focus on writing appellate amicus curiae briefs in cases that have a novel or as yet unsettled tax consequences. In the appellate level course, students concentrate on writing amicus curiae briefs in a novel or complex cases that impact tax law. Our extensive tax program has allowed law students and graduates to be placed in permanent and summer positions with prestigious law firms, the Internal Revenue Service, and the tax law departments of major accounting firms. Students may also participate in externships with the Internal Revenue Service, the Department of Justice Tax Division and the California State Board of Equalization. This course introduces students to the system of federal income taxation of individuals. The tax system is studied with emphasis on basic concepts rather than detailed computations. Significant attention is given to the public policy served by various provisions of the Internal Revenue Code. Primary consideration is given to principles and policies relating to the taxation of individuals including procedure, income, deductions, gains and losses, and transactional aspects of income taxation. The Internal Revenue Code and Regulations are emphasized. This course is a continuation of the basic Federal Income Taxation course for students in the tax law program. It includes federal income tax topics that are not generally addressed in detail or at all in the basic course, such as: in-depth coverage of tax accounting issues, imputation under IRC section 7872, involuntary conversions, alternative minimum tax, “kiddie tax”, employee benefits and deferred compensation (including IRC section 83) and tax law policy issues. A comprehensive study of the federal transfer tax system, including the gift tax, the estate tax and the generation-skipping transfer tax, with some attention to planning issues, including the tax treatment of property owned at death and property transferred during life, the marital and charitable contribution deductions and other deductions and credits, as well as an overview of procedural and valuation issues. Problems in the taxation of subchapter K partnerships, subchapter C corporations, and subchapter S corporations are covered by this course. Topics pertaining to partnership taxation include the formation, operation, and termination of general and limited partnerships. Class discussion is held concerning the definition of the partnership and the possible treatment of a partnership and the possible treatment of a partnership as an association. Topics pertaining to corporate taxation include tax treatment of a corporation and a corporate shareholder with respect to corporate formation; organization and property transfers, dividends and distributed income; accumulated earnings and undistributed income; non-liquidating corporate distributions; collapsible corporations; personal holding companies; and sale or liquidation of a corporation. An area often ignored in traditional legal research courses is the array of materials dealing with tax matters. Such material is often separated from other library materials, and many practicing attorneys possess little ability to research tax matters for their clients. This course explores the fundamentals of tax research and is also an extensive survey of tax research sources and techniques, accompanied by several writing assignments. Prerequisite: Federal Income Tax. This course is an elective for the Certificate in Taxation. Under a special IRS and Tax Court rules of practice, students in this clinical education course are permitted to handle actual cases on a wide variety of tax issues at various stages of exam, appeal, court and collections. Under supervision of Attorney-Professors, students are responsible for all aspects of their cases including meeting with clients, gathering facts and evidence, researching applicable laws, and meeting with the IRS to discuss case in an effort to negotiate a favorable outcome. If the case is for trial, the student normally represents the client in court and completes all post trial work. A study of administrative procedures and taxpayer rights and remedies in dealing with the Internal Revenue Service, including assessment procedures; refund procedures; administrative appeals, conference and settlement procedures; interest; collection procedures, including tax liens and levies on property; transferee liability; limitation periods and their mitigation; burden of proof; choice of forum; IRS summons; requests for rulings and technical advice; and civil penalties. The clinical component of the Tax Procedure and Administration course allows students to handle actual tax controversy cases for low income taxpayers on a pro bono basis before the IRS and in U.S. Tax Court under special rules of student practice. Students learn the practical application of tax procedures and handle all aspects of their cases, including trial if necessary. Specific offerings may vary from year to year, depending on the periodic rotation of electives, instructor availability, student interest, and scheduling dynamics. For more information, view our course descriptions. Students who earn the Tax Law Emphasis Certificate will understand the basic principles of law applicable across a breadth of tax law including personal, business and estate & gift tax. Students who earn the Tax Law Emphasis Certificate will be able to understand clients’ objectives, recognize the legal issues that arise from them and recommend strategies to either achieve client objectives or recommend alternative solutions if client objectives cannot be met. Chapman is proud of the teaching and scholarship accomplishments of our tax faculty. Out tax faculty includes leaders in the field as evidenced by their experience and respected publications. They offer excellent classroom tutelage in tax, and students may have an opportunity to participate in scholarship by acting as research assistants for our professors. "Many lawyers have told me how disappointed they are that they did not take a basic federal income tax course while in law school. As practitioners, they have experienced the shell shock of not having been exposed to basic federal income tax law when called upon to apply tax law in practices such as family law, commercial law, real estate, and even civil litigation. That is one reason why Chapman requires all students to take the course." Our legal clinics provide pro bono services and real world legal experience for students. Students have access to an extensive tax law collection in the law library, including tax law case reporters, treatises, and periodicals. A smaller, satellite tax library is also available to students in the tax clinic conference room through the courtesy of PricewaterhouseCoopers, LLP. Students are also provided with free access to tax specific electronic research tools through the courtesy of RIA and Tax Analysts while at Chapman.